The Kaito KA350 is a compact emergency radio. There are five ways to power the KA350: dynamo cranking, solar panel power, three AAA cells (not supplied), built-in rechargeable Ni-MH (3.6V 300 mAh) battery pack, AC adaptor (not supplied) or from a computer via the USB port. 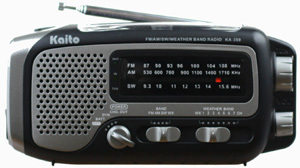 This radio tunes AM, FM and shortwave 9.3-15.6 MHz. The weather band tunes 162.400/162.425/162.450/162.475/162.50/162.525/162.55 MHz. 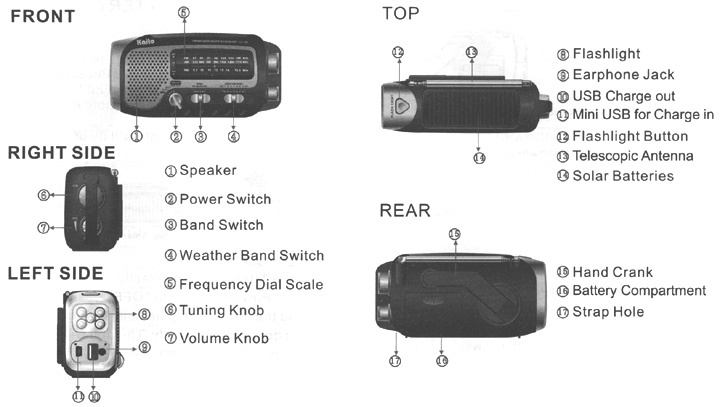 The radio is built with a multi-function 5xLED flashlight on the left side panel. The radio has a 3.5 mm earphone jack and includes ear buds. 149x74x49mm 270 g.